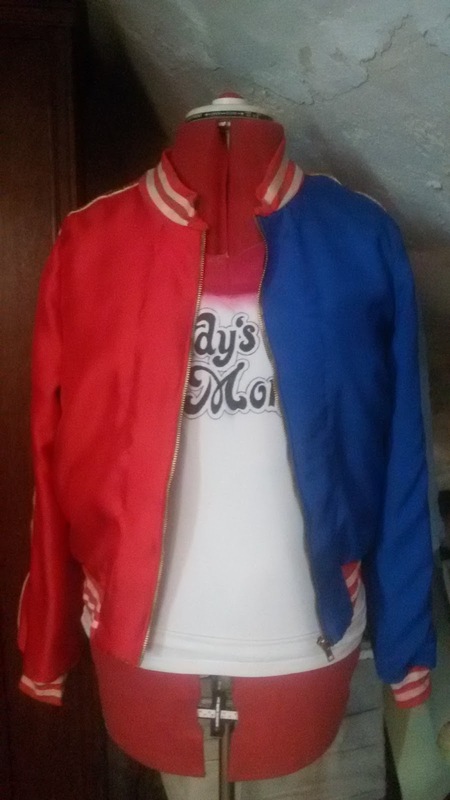 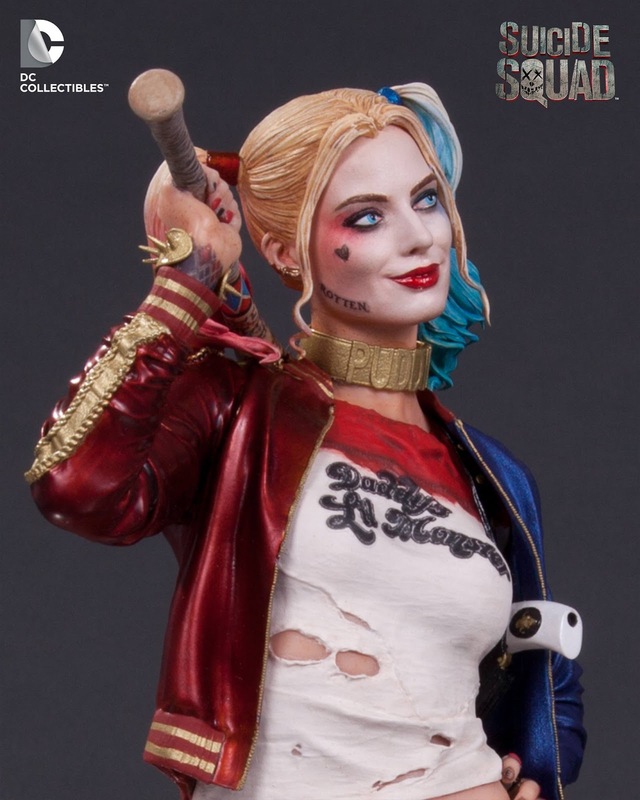 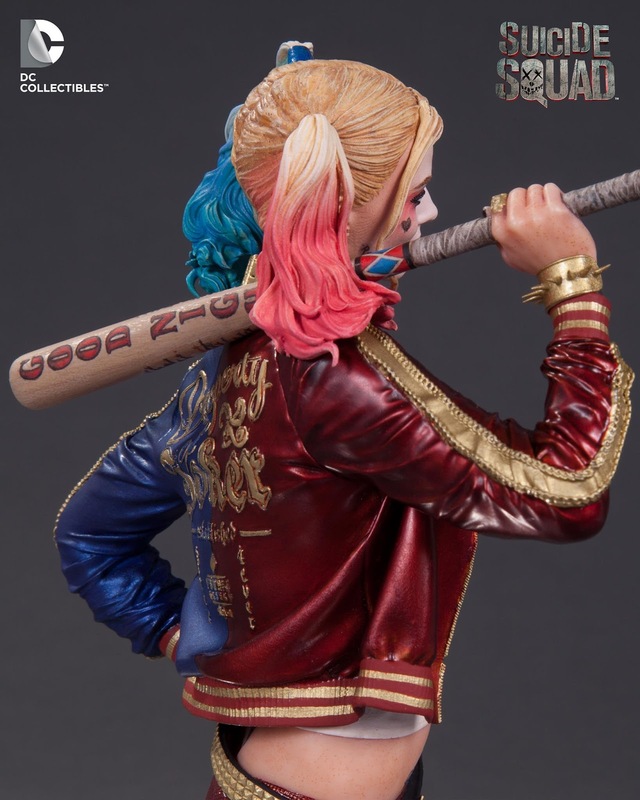 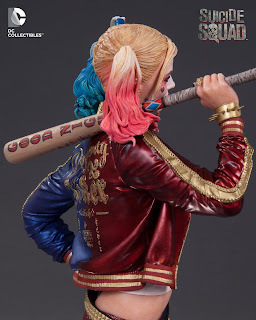 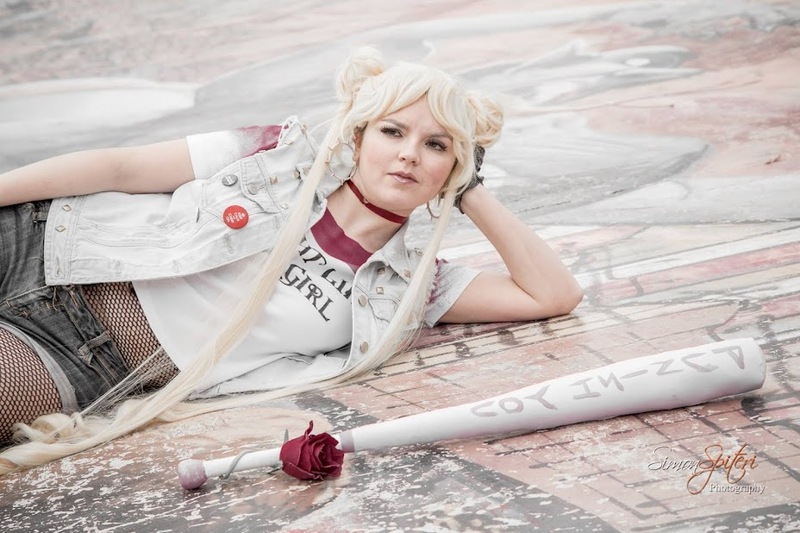 I looked at what other cosplayers had used to make the jacket, as well as looking at stills from Suicide Squad and the Harley Quinn action figure. 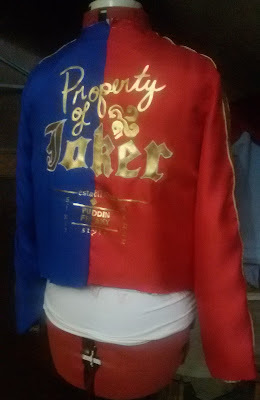 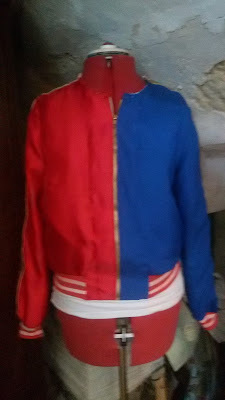 I decided to use satin for the jacket, gold spandex for the applique and trim, and red jersey with painted stripes for the collars and cuffs. 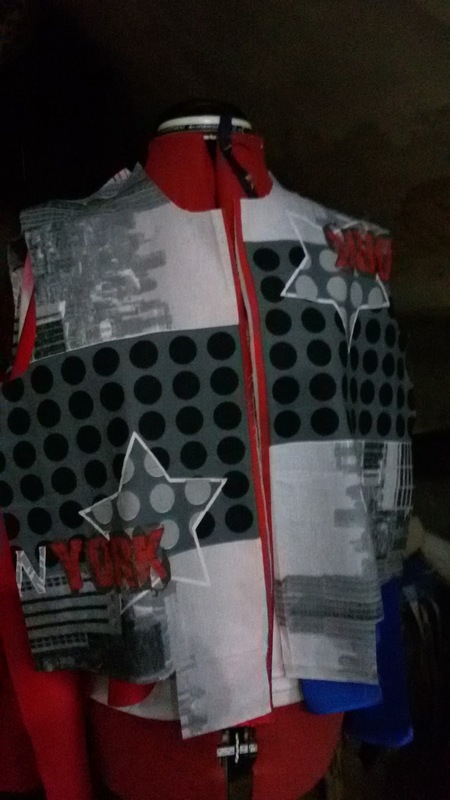 The first step was the cut out all of the pattern piece. 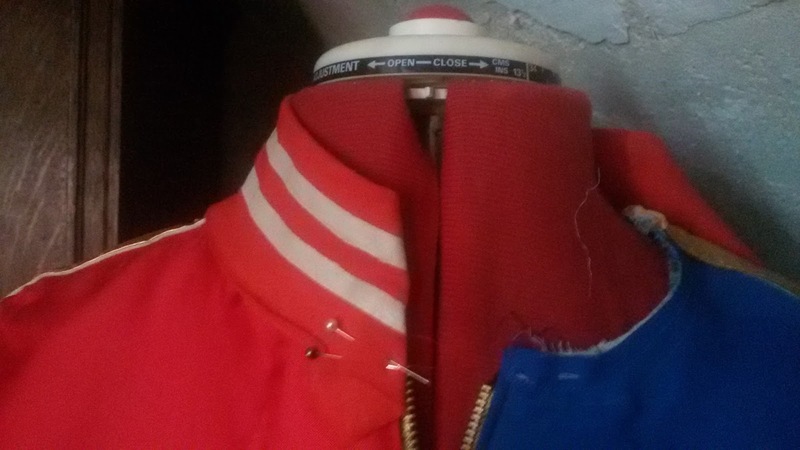 I used a Burda style pattern for a bomber jacket, with a few alterations, such as removing the back yoke and back pleat, and combining the two sleeve pieces into one. Once the two back pieces were sewn together, it was time for the applique. This was very tedious. 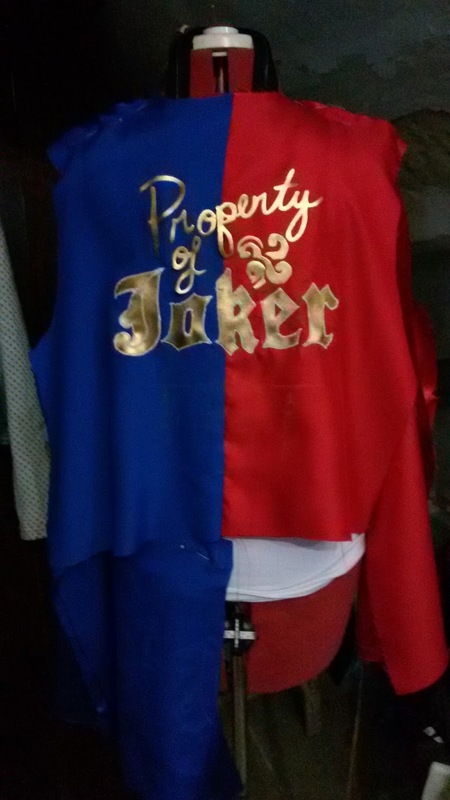 I had to print out an image of the design on Harley's jacket, and trace it on to a piece of gold spandex that I had previously ironed heat and bond (or some similar product) to. Then I had to cut out the letters. 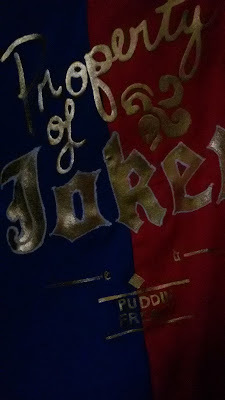 This wasn't too difficult with the large letters, but I had to use a scalpel for all the smaller letters. I ironed on the letters and stitched the larger letters in place with a satin stitch, and secured the other letters with fabric glue, as the heat and bond that I used wasn't sticky enough. 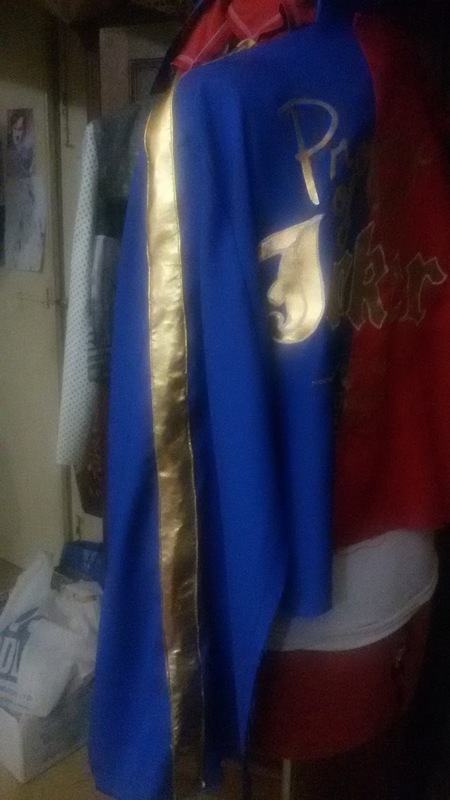 The next step was the trim for the sleeves. This is made from interfaced gold spandex, sewn into a tube and then ironed flat. 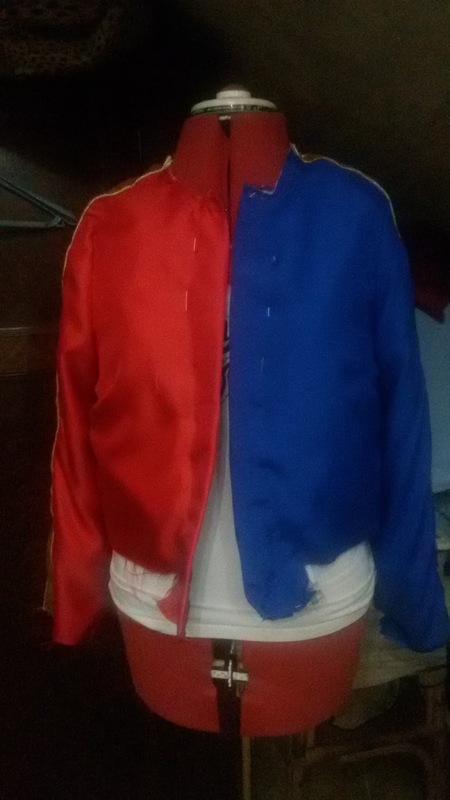 Treating this like a huge piece of bias tape could also work. Once the trim was ready, I pinned and sewed it onto the sleeves-make sure your sleeves are already sewn to the jacket body for accuracy. I decided to line the jacket with cotton to make the jacket more comfortable. 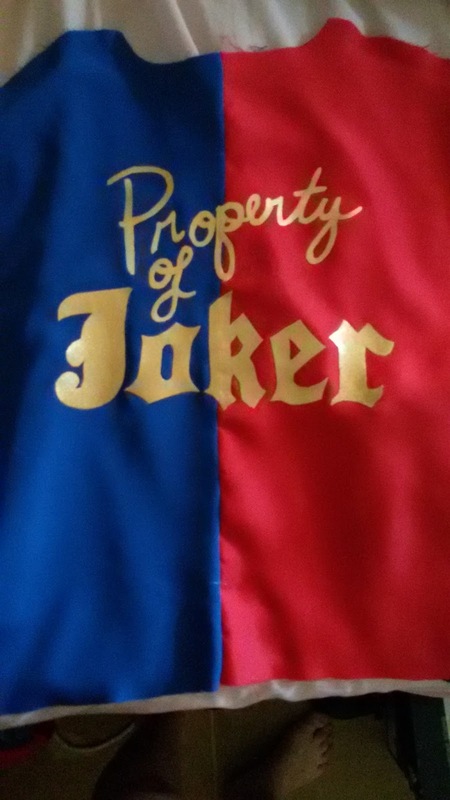 I also added some pockets to the lining for my phone and keys. 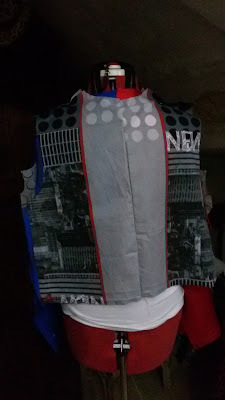 Once the lining was sewn together I place it inside the outer layer of fabric and pinned everything in place. 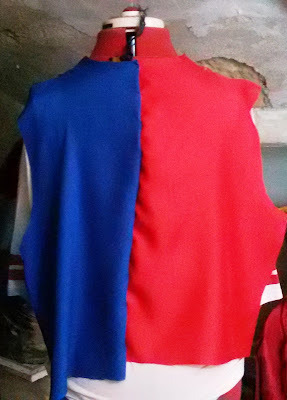 I hand-sewed the facing to the lining, and basted the neck and sleeve openings in place. 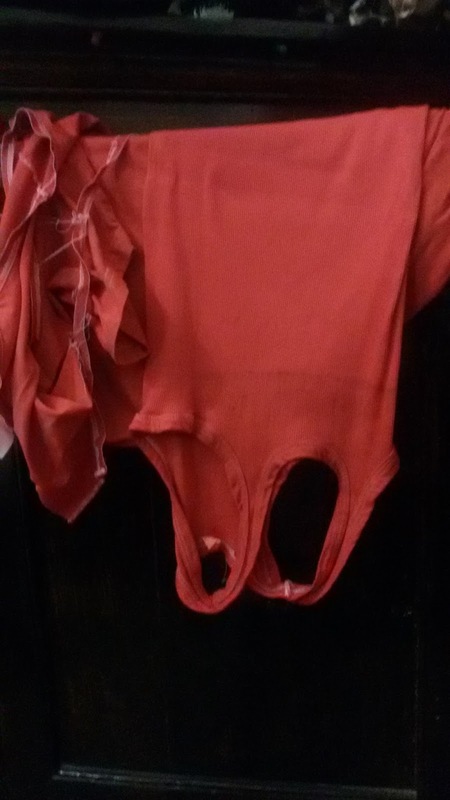 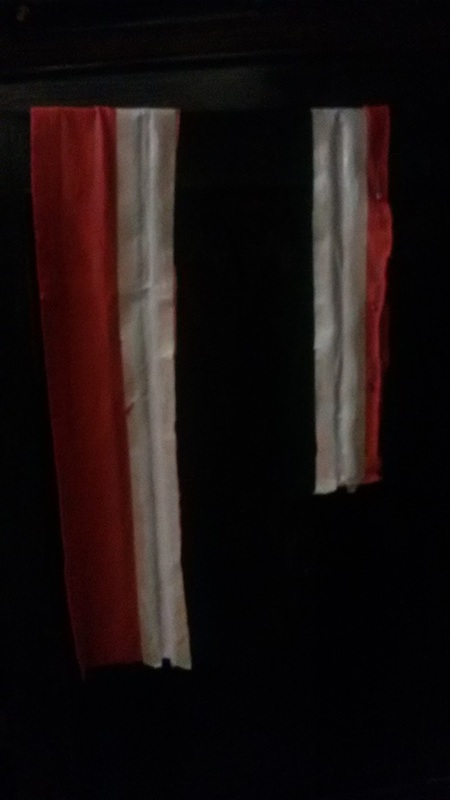 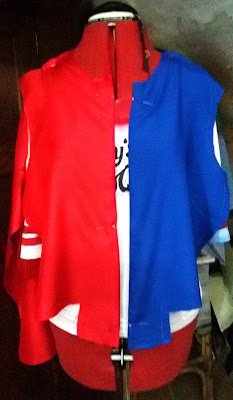 To make the collar, waistband, and cuffs, I dyed a cotton/elastane vest red, and cut out long strips. 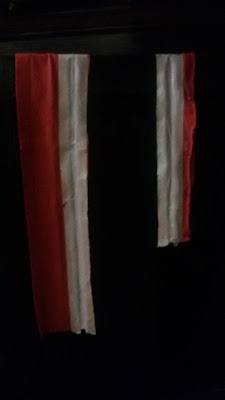 I used masking tape to mark out the stripes, and painted those using acrylic and fabric medium. 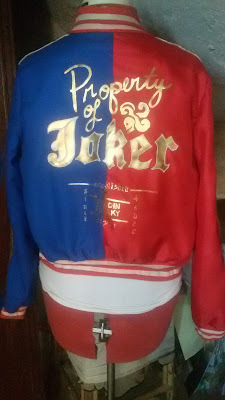 I sewed on the cuffs, then added a zip (spray painted gold). NExt I sewed on the collar and waistband.